Small membrane-permeable molecules are now widely used during maintenance and differentiation of embryonic stem cells of different species. In particular the glycogen synthase kinase 3 (GSK3) is an interesting target, since its chemical inhibition activates the Wnt/beta-catenin pathway. In the present comparative study four GSK3 inhibitors were characterized. Cytotoxicity and potential to activate the Wnt/beta-catenin pathway were tested using the commonly used GSK3 inhibitors BIO, SB-216763, CHIR-99021, and CHIR-98014. Wnt/beta-catenin-dependent target genes were measured by quantitative PCR to confirm the Wnt-reporter assay and finally EC50-values were calculated. CHIR-99021 and SB-216763 had the lowest toxicities in mouse embryonic stem cells and CHIR-98014 and BIO the highest toxicities. Only CHIR-99021 and CHIR-98014 lead to a strong induction of the Wnt/beta-catenin pathway, whereas BIO and SB-216763 showed a minor or no increase in activation of the Wnt/beta-catenin pathway over the natural ligand Wnt3a. The data from the Wnt-reporter assay were confirmed by gene expression analysis of the TCF/LEF regulated gene T.
Out of the four tested GSK3 inhibitors, only CHIR-99021 and CHIR-98014 proved to be potent pharmacological activators of the Wnt/beta-catenin signaling pathway. But only in the case of CHIR-99021 high potency was combined with very low toxicity. Small molecules are attractive chemical compounds to control pluripotency in murine embryonic stem cells [1–6]. They may also be used to direct embryonic stem (ES) cell fates during differentiation [7–10] or enhance the reprogramming of adult cell types into iPS cells . In contrast to growth factors or cytokines, they offer distinct advantages such as a well-defined activity, good stability upon heat exposure in a cell culture incubator, less batch-to-batch differences, and modest costs. Chemical inhibitors of the glycogen synthase kinase 3 (GSK3) are very attractive tools as they allow the control of pluripotency in mouse and rat ES cells [5, 6] and may be used to direct human ES cells into mesodermal or endodermal cell fates via activation of the canonical Wnt-pathway [12–16]. The Wnt/beta-catenin pathway controls miscellaneous biological processes during tissue development by autocrine and paracrine activities . When Wnt-signaling is activated by binding of secreted Wnt-protein to its receptor, dishevelled (Dvl/Dsh) is recruited and inhibits the GSK3 located in the beta-catenin destruction complex . This leads to an accumulation of free non-phosphorylated beta-catenin in the cytosol, which translocates to the nucleus and transactivates Wnt-target genes together with the T-cell factor (TCF)/lymphoid-enhancing factor (LEF) family of transcription factors . Thus, chemical inhibition of the GSK3 (herewith referred to as GSK3i) leads to a pharmacological activation of the canonical Wnt-signaling pathway. However, the compound to be used in a study should be carefully selected as small molecules may exhibit cytotoxicity, side effects, and differ in activity. In this study the effect of four commonly used GSK3 inhibitors, namely BIO, SB-216763, CHIR-99021, and CHIR-98014 was analyzed in a comparative fashion in two different mouse embryonic stem cell lines (ES-D3 and ES-CCE). Specifically, the cytotoxicity, the ability to activate the Wnt/beta-catenin-pathway, and the changes in gene and protein expression were analyzed in a defined serum-reduced medium devoid of LIF. The results show that one of the four tested compounds, CHIR-99021, is optimally suited for strong activation of the Wnt/beta-catenin-pathway without significant concomitant toxicity. RPMI1640 advanced, KO-DMEM, NEAA, and glutamax were obtained from Life Technologies (Darmstadt, Germany) and fetal calf serum was from (PAA Laboratories/GE Healthcare, Cölbe, Germany). The GSK3 inhibitors BIO, SB-216763, and CHIR-99021, were from Tocris Bioscience (Wiesbaden-Nordenstadt, Germany) and CHIR-98014 was purchased from Axon Medchem (Groningen, Netherlands). Wnt3a was obtained from Peprotech (Hamburg, Germany) and Matrigel was from Corning (Corning, NY, USA). All primers were synthesized by Life Technologies. The RevertAid™ H-Minus M-MuLV reverse transcriptase was purchased from Thermo Fisher Scientific (Braunschweig, Germany). The GoTaq® Taq polymerase was from Promega (Mannheim, Germany) and dNTPs from Genecraft (Münster, Germany). Unless mentioned otherwise, chemicals were obtained from Sigma-Aldrich (Taufkirchen, Germany). To maintain the pluripotency of the mouse ES cell lines ES-D3  and ES-CCE , they were routinely cultured on gelatine-coated dishes in KO-DMEM containing 25 mM glucose supplemented with 15% FCS, 2 mM L-glutamine, 100 μM NEAA, 100 μM 2-mercaptoethanol, penicillin/streptomycin, and 1,000 U/ml LIF (eBiosciences, Frankfurt, Germany) [10, 21]. The medium was changed daily and the cells were passaged 2–3 times per week. The basal medium for the comparative experiments was RPMI advanced supplemented with 0.2% FCS, penicillin/streptomycin and 1-fold glutamax with different concentrations of BIO, SB-216763, CHIR-99021 and CHIR-98014. A randomized control was performed with basal medium without growth factors and/or small molecules. Physiological activation of the Wnt/beta-catenin-pathway was tested in medium supplemented with 50 ng/ml Wnt3a. The viability of the mouse ES cells was determined after exposure to different concentrations of GSK3 inhibitors for three days using the MTT assay . The decrease of MTT activity is a reliable metabolism-based test for quantifying cell viability; this decrease correlates with the loss of cell viability. 2,000 cells were seeded overnight on gelatine-coated 96-well plates in LIF-containing ES cell medium. On the next day the medium was changed to medium devoid of LIF and with reduced serum and supplemented with 0.1 – 1 μM BIO, or 1 – 10 μM SB-216763, CHIR-99021 or CHIR-98014. Basal medium without GSK3 inhibitors or DMSO was used as control. All tested conditions were analyzed in triplicates. The Wnt/beta-catenin reporter assay was performed with the M50 Super 8× TOPFlash and M51 Super 8× FOPFlash vector containing the firefly luciferase gene under the control of TCF/LEF binding sites (M50 Super 8x TOPFlash) or mutated bindings sites (M51 Super 8× FOPFlash) . 12,500 cells were seeded overnight on gelatine-coated 96-well plates in LIF-containing ES cell medium. On the next day the cells were transfected using Lipofectamine (Life Technologies) with one of the aforementioned vectors plus pGL4.75 [hRluc/CMV] (Promega) encoding the renilla luciferase reporter gene hRluc as a transfection control. Six hours after transfection the medium was changed to medium devoid of LIF, with reduced serum, and supplemented with 0.5 μM Bio, 5 μM SB-2167763, 5 μM CHIR-99021 and 1 μM CHIR-98014. The Dual-Luciferase® reporter assay system (Promega) was employed 48 and 72 h after medium change to follow the luminescence reaction using a GloMax®-multi detection system (Promega). Total RNA was isolated from the cells using the RNeasy Kit (Qiagen, Hilden, Germany). Briefly, the cells were lysed in Qiazol (Qiagen), the hydrophilic phase was loaded onto RNA spin columns, and RNA was then prepared as instructed. cDNA synthesis was performed with random hexamer primers and 2 μg of the isolated total RNA following the manufacturer’s instructions. 10–20 ng of cDNA was then loaded in each well of a 384-well plate and specific primers were mixed with the GoTaq® PCR master mix according to the manufacturers’ instructions. Primer sequences were (5’-3’): T fw: catcggaacagctctccaacctat, rev: gtgggctggcgttatgactca, Nanog fw: ccctgaggaggaggagaacaaggtc, rev: ccactggtttttctgccaccgc, and Pou5f1 fw: aggcccggaagagaaagcgaacta, rev: tgggggcagaggaaaggatacagc. Each qPCR amplification was performed in triplicates and the gathered data were normalized with qBasePlus (Biogazelle, Zwijnaarde, Belgium) against the housekeeping genes G6pdx, Tbp, and Tuba1a. Immunofluorescence was performed according to standard procedures. ES cells were treated on 6-well plates with different GSK3 inhibitors and after 48 h 100,000 cells were re-seeded in each cavity of Matrigel-coated glass slides (Zellkontakt, Nörten-Hardenberg, Germany). After 24 h in medium the cells were fixed in 4% (w/v) paraformaldehyde for 45 min at 4°C. Subsequently, the cells were blocked for 20 min in PBS plus 0.2% Triton X-100, 6% BSA, and 1 mg/ml NaBH4. Primary and secondary antibodies were diluted in PBS with 0.1% Triton X-100 and 0.1% BSA. Primary antibodies were incubated on the slides for 2.5 h at room temperature (RT) or overnight at 4°C. Secondary antibodies were incubated on the slides for 1 h at RT. The following primary antibodies were used: anti-Oct3/4 (sc-5279, Santa Cruz Biotechnology, Heidelberg, Germany) and anti-Brachyury (AF2085, R&D Systems, Minneapolis, MN, USA). Secondary antibodies were obtained from Dianova (Hamburg, Germany). Finally, the slides were mounted with immunoselect antifading mounting medium containing DAPI (Dianova) to counterstain the nuclei. The stained cells were examined using an Olympus IX81 inverted microscope (Olympus, Hamburg, Germany). Data were expressed as mean values ± SEM unless stated otherwise. Statistical analyses were performed using the GraphPad Prism software (Graphpad, San Diego, CA, USA) applying Student’s t-test or ANOVA followed by Bonferroni’s or Dunnett’s post hoc test for multiple comparisons. Two mouse stem cell lines, ES-D3 and ES-CCE, were exposed to different concentrations of the GSK3 inhibitors BIO, SB-216763, CHIR-99021 and CHIR-98014 in defined medium devoid of LIF and with low FCS. Their toxicity was tested using the MTT assay; Bio at concentrations of 0.1 to 1 μM and all other compounds at 1 – 10 μM. As controls the cells were treated without compounds in the medium with the solvent DMSO as vehicle control. Differentiation in the presence of DMSO did not significantly decrease cell viability in both mouse ES cell lines (Figure 1A/B). However, toxic effects of the GSK3 inhibitors were observed for all compounds. Cell viability of mouse embryonic stem cells after exposure to GSK3 inhibitors. (A) Cell viability of the mouse embryonic stem cell line ES-D3 after a three day treatment with different concentrations of BIO, SB-216763, CHIR-99021 and CHIR-98014. Cell viability was measured with the MTT assay. DMSO without inhibitors was used as vehicle control. Data are expressed as percentages normalized to the control condition without inhibitors. (B) Cell viability of the mouse embryonic stem cell line ES-CCE after a three day treatment with different concentrations of BIO, SB-216763, CHIR-99021 and CHIR-98014. Values are means ± SEM, n = 3-5. ANOVA plus Dunnett’s post hoc test. ** p ≤ 0.01, * p ≤ 0.05 compared to the control. In detail the viability of ES-D3 cells was reduced by 25.7% at 0.25 μM, 58.7% at 0.5 μM, 68.7% at 0.75 μM and 83.5% at 1 μM BIO. Calculation of the half maximal inhibitory concentration yielded in an IC50 of 0.48 μM for BIO. In presence of SB-216763 the viability of the ES-D3 cells was reduced by 1.7% at 1 μM, 29.8% at 2.5 μM, 55.6% at 5 μM, 56.1% at 7.5 μM and 57.2% at 10 μM SB-216763 with an IC50 of 5.7 μM. In the presence of CHIR-99021 the viability of the ES-D3 cells was reduced by 24.7% at 2.5 μM, 56.3% at 5 μM, 61.9% at 7.5 μM and 69.2% at 10 μM CHIR-99021 with an IC50 of 4.9 μM. CHIR-98014 reduced the viability by 52% at 1 μM and showed the greatest toxicity with increasing concentrations. The IC50 of CHIR-98014 was 1.1 μM (Figure 1A). ES-CCE cells generally showed a higher toxicity after GSK3i exposure (Figure 1B). To assess the activation of the Wnt/beta-catenin signaling pathway by GSK3i, a dual luciferase reporter assay was used (Figure 2A/B). Mouse ES cells were transfected with the M50 TOPflash firefly luciferase vector, comprising seven TCF/LEF binding sites or as a negative control with the M51 FOPflash vector harboring mutated binding sites . To normalize the transfection efficiency, a hRluc/CMV vector with a constitutive expression of the renilla luciferase was used. Mouse ES cells of both lines were incubated with GSK3 inhibitors with concentrations close to the IC50 values calculated for the ES-D3 cell line. Dual luciferase luminescence was measured 48 and 72 h after cultivation with one of the inhibitors. In ES-D3 cells (Figure 2A) cultivation with CHIR-99021 and CHIR-98014 resulted in a significant activation of the Wnt/beta-catenin pathway. The measured luminescence signals were significantly increased compared to control cells without inhibitors and to cells, which were incubated with 50 ng/ml Wnt3a. In the presence of SB-216763, the luminescence signal was also significantly increased compared to control cells but not to Wnt3a-incubated cells. This pattern was nearly identical for the 72 h dataset. Incubation with BIO did not result in a robust activation of the Wnt/beta-catenin pathway above controls (Figure 2A). Activation of the canonical Wnt-pathway by GSK3 inhibition. 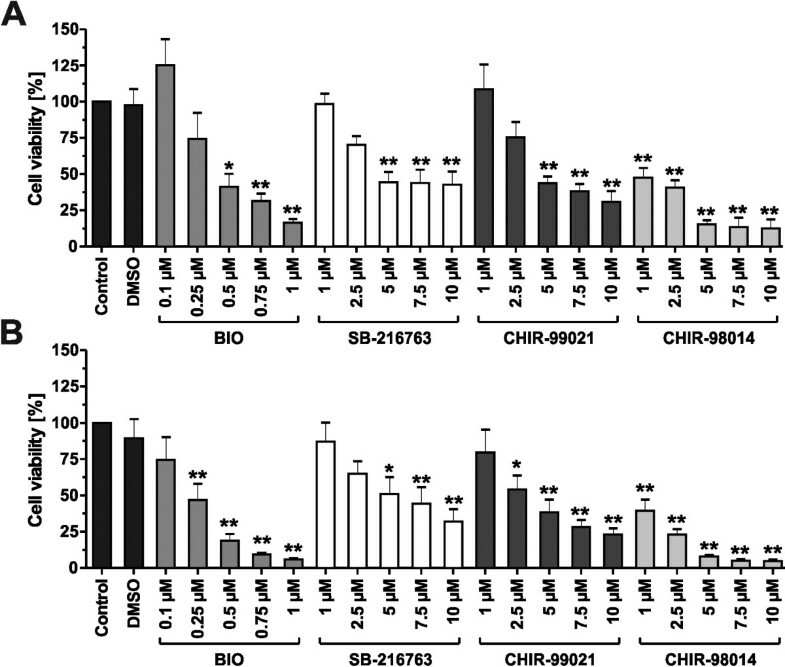 (A, B) Assessment of the Wnt/beta-catenin pathway activity after exposure to the GSK3 inhibitors BIO (0.5 μM), SB-216763 (5 μM), CHIR-99021 (5 μM) or CHIR-98014 (1 μM) in (A) ES-D3 cells and (B) ES-CCE cells using the M50 Super 8x TOPflash luminescence reporter system. A M51 Super 8x FOPflash vector with mutated TCF/LEF binding sites was used as a negative control. As a positive control, the ES cells were incubated with 50 ng/ml Wnt3a. Values are means of the relative light units of the firefly and renilla luciferase luminescence ratio ± SEM, n = 6. ** p < 0.01, * p < 0.05 compared to randomly treated cells, ## < 0.01, # < 0.05 Wnt3a treated cells, ANOVA with Dunnett’s post hoc test. A similar pattern with slight differences was detected for ES-CCE cells (Figure 2B). Treatment of ES-CCE cells with CHIR-98014 showed a significant increase of Wnt-signaling after 48 and 72 h, whereas CHIR-99021 showed only a significant increase at 72 h compared to random controls or Wnt3a-treated cells. In contrast to ES-D3 cells, a higher luminescence noise was detected for the M51 FOPflash vector transfections, which increased with time. Incubation with BIO or SB-216763 resulted in detectable luminescence signals, which were nevertheless comparable to that of negative or positive controls (Figure 2B). A gene expression profile of the Wnt-regulated gene T and the pluripotency master regulators Pou5F1 and Nanog was measured in ES-D3 cells after six days of treatment with 0.5 μM BIO, 5 μM SB-216763, 5 μM CHIR-99021, and 1 μM CHIR-98014 (Figure 3). As a negative control, the cells were incubated without inhibitors or growth factors (random). A significant effect was observed for the T gene expression, which was induced up to 2,500-fold in CHIR-99021 or CHIR-98014 treated cells (Figure 3A). The induction by BIO and SB-216763 was lower but still up to 300-fold higher compared to undifferentiated or randomly differentiated cells. Maximal induction of the T gene expression in the presence of GSKi was detected after three days of differentiation (Figure 3A). The gene expression of Nanog decreased in randomly treated control cells, whereas in samples cultivated with GSK3i it showed an increased expression (Figure 3B). Comparably, Pou5F1 gene expression decreased over time in random controls whereas GSK3i did not significantly change the gene expression (Figure 3C). Gene expression changes upon treatment with GSK3 inhibitors. (A-C) qPCR analysis of T and the pluripotency markers Nanog and Pou5F1 after a six day treatment of mouse ES-D3 cells with BIO (0.5 μM), SB-216763 (5 μM), CHIR-99021 (5 μM), or CHIR-98014 (1 μM). Randomized differentiation without any growth factors or small molecules was used as a control. Values are calibrated normalized relative quantities (CNRQ) after normalization to three stably expressed housekeeping genes and scaling to undifferentiated ES cells. Values are means ± SEM, n = 4–5. ** p < 0.01, * p < 0.05 compared to randomly differentiated ES cells of the same day, ANOVA with Dunnett’s post hoc test. The T gene has been reported as a TCF/beta-catenin target gene . Thus, immunostaining of Brachyury and counter-staining for Oct3/4 was performed to verify that GSK3i was functionally relevant for the Wnt/beta-catenin signaling pathway in mouse ES cells. Immunofluorescence staining of Brachyury and Oct3/4 showed almost no Brachyury-positive cells after a three day treatment with 0.5 μM BIO (Figure 4A). In contrast, almost all cells were positive for Oct3/4. After treatment with SB-216763, all cells were positive for Oct3/4 and ~3% were double-positive for Brachyury and Oct3/4. Both transcription factors were localized at the nucleus and during cell division the fluorescence signal was observed in the cytoplasm. Treatment with CHIR-99021 (5 μM) or CHIR-98014 (1 μM) yielded around 43% or 50% Brachyury-positive cells, respectively, from which the majority was additionally positive for Oct3/4 (Figure 4A). 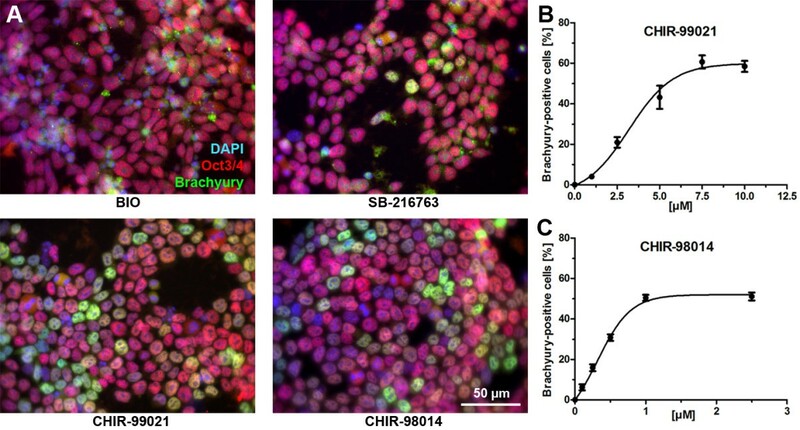 Counting of cells positively stained for Brachyury revealed a concentration-response curve for CHIR-99021 and CHIR-98014 with saturation of the curve at 60% or 50% Brachyury-positive cells, respectively (Figure 4B/C). EC50-values were 3.19 μM for CHIR-99021 and 0.32 μM for CHIR-98014. Immunofluorescence staining of Brachyury and Oct3/4 in ES-D3 cells treated with GSK3 inhibitors. (A) Fluorescence micrographs showing the protein expression of Brachyury/Oct3/4 after a three day differentiation of ES-D3 cells with BIO (0.5 μM), SB-216763 (5 μM), CHIR-99021 (5 μM), or CHIR-98014 (1 μM). Nuclei were counterstained with DAPI (blue). The merge is shown in yellow. Original magnification 400x. Scale bar = 50 μm. Quantitative analysis of Brachyury-positive cells after a three day treatment with of 0 – 10 μM CHIR-99021 (B) and 0 – 2.5 μM CHIR-98014 (C). Values are means ± SEM of six analyzed images of 2 different experiments. In this comparative study the effect of four commonly used GSK3 inhibitors on mouse ES cells was studied with respect to their cytotoxicity and the potential to activate the canonical Wnt-signaling pathway. The two studied mouse ES cell lines originate from the same mouse strain and were isolated using the same methods [19, 20], nevertheless they responded differently to a treatment with GSK3 inhibitors. The ES-CCE cell line was more prone to GSK3i induced cell death then the ES-D3 cell line. In addition, the activity of these compounds was different in the two cell lines. SB-216763 and CHIR-99021 caused the smallest reduction of the viability in both lines, whereas CHIR-98014 induced a high rate of cell death in ES-D3 cells and in particular in ES-CCE cells. The small molecule BIO, which has been used in a number of embryonic stem cell studies [25–27], was strongly cytotoxic in both ES cell lines already at concentrations below 1 μM. This is a surprising result, since other studies used this inhibitor at much higher concentrations (2-5 μM) [25–28]. In these studies the cytotoxicity was not tested and the inhibitor was used in presence of a high fetal calf serum concentration or knock-out serum replacement concentration, which might have quenched the cytotoxic effect. With respect to the effect on the canonical Wnt-pathway, CHIR-99021 and CHIR-98014 showed the greatest activation potential, which was significantly higher than that of Wnt3a. Thus, GSK3i by these two compounds is a more potent chemical hyperactivator of the canonical Wnt-pathway than the natural ligand Wnt3a. Surprisingly, SB-216763 caused a weaker activation of the Wnt/beta-catenin-pathway in the TOPflash-assay comparable to that of Wnt3a. This proves that this compound is less suited for GSK3i than the two CHIR-inhibitors. An activation of the Wnt-pathway by BIO in ES-D3 was barely detectable. Only in ES-CCE cells a distinct signal, delayed by 24 h, could be detected. Higher concentrations could not be analyzed due to the high cytotoxicity. 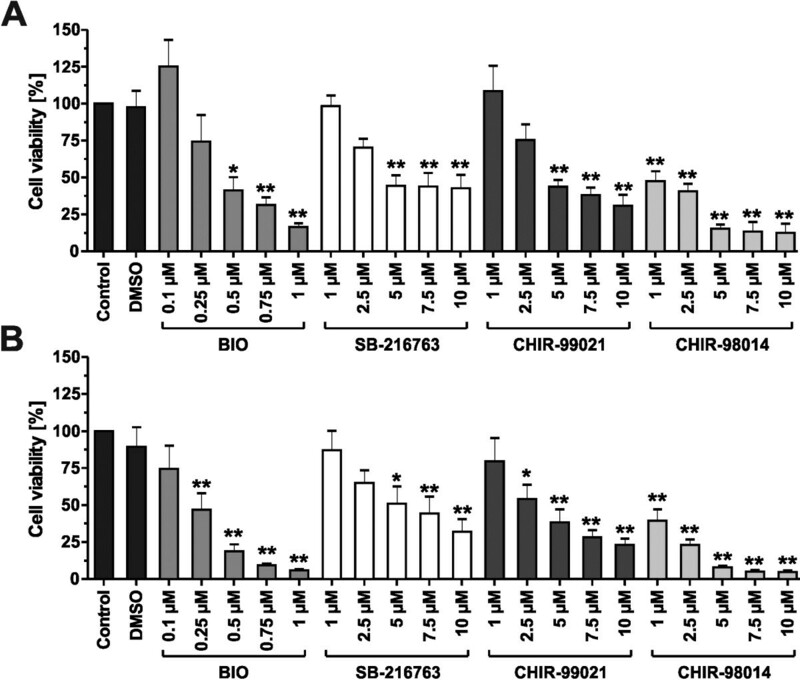 Bain and co-workers recommended CHIR-99021 as the most selective GSK3 inhibitor although the tests in this study were performed in a cell-free system and potential cytotoxic effects were not analyzed . Next to the Wnt/beta-catenin-pathway the GSK3 fulfills a myriad of cellular functions . Thus, some effects of the treatment with GSK3 inhibitors might not be related to the Wnt-pathway alone. In this line it is even more important to verify a robust activation of the Wnt-pathway either by analyzing its activity or analyzing proper targets downstream of Wnt/beta-catenin. It has been previously reported that double-knockout of both GSK3 isoforms in mouse ES cells yielded an induction of T, Pou5F1 (Oct3/4) and Nanog upon differentiation . In the present study we analyzed these three genes during culture conditions that would allow randomized differentiation of mouse ES cells. In confirmation to previous results , gene expression of both pluripotency markers was not decreased in the presence of GSK3i, whereas it was decreased in random controls. This is in line with earlier studies reporting the maintenance of expression of pluripotency factors by GSK3i [3, 4, 31]. Several studies reported that the inhibition of the GSK3, FGF- and ERK-signaling pathways resulted in improved derivation of new mouse ES cell lines [32, 33]. These findings lead to the development of the 3i and 2i media, which are now routinely used for the derivation and culture of mouse and rat ES cells [5, 6]. Additionally, a strong increase in gene expression of T was observed upon GSK3i. The strongest effect was detected for CHIR-99021 and CHIR-98014, which confirms the reporter assay results. The increased gene expression yielded Brachyury-positive cells predominantly together with Oct3/4 in case of both CHIRs but not in the presence of BIO and SB-216763. Interestingly, only a small subpopulation accounted for the 2,500-fold increase in T expression as measured by qPCR. This observed heterogeneity raises the question why some cells did not acquire Brachyury-positivity whereas another subpopulation showed a significantly increased Brachyury expression. Small molecule inhibitors of GSK3 have become valuable reagents for studies on pluripotent stem cells. In murine ES cells they may be used to maintain pluripotency whereas in human ES cells GSKi was shown to be useful in differentiation experiments [15, 25]. The results presented in this study show that mouse ES cell lines can respond differently to GSK3i. Thus, effective and non-toxic concentrations of GSK3 inhibitors and the duration of their treatment need to be carefully titrated for each mouse ES cell line. Two strong GSK3 inhibitors, namely CHIR-99021 and CHIR-98014, were identified and characterized. These inhibitors allowed a pharmacological hyperactivation of the Wnt/beta-catenin signaling pathway in mouse ES cells, more potently than that achieved by the natural ligand Wnt3a. Thus, these GSK3 inhibitors are very useful compounds for further experimentation with pluripotent cells. The skilful technical assistance of R. Strauss is gratefully acknowledged. This work has been supported by the Deutsche Forschungsgemeinschaft (German Research Foundation) within the framework of the Cluster of Excellence REBIRTH. ON designed the study, analyzed and interpreted the data and wrote the manuscript. JL collected and interpreted the cytotoxicity and reporter assay data. UD analyzed and interpreted the data and wrote the manuscript. CD performed immunofluorescence and real-time PCR and wrote the manuscript. SL designed the study, wrote and finally approved the manuscript. All authors read and approved the final manuscript.